Uniform small to medium size fruit ideal for export and pre-pack. Excellent uniformity – medium-sized fruit with outstanding internal quality and flavour. Medium to large high quality fruit which is suitable for freshmarket and processing. Medium to large elongated fruit – this variety is well suited to winter harvest in the frost-free production areas – it has good virus resistance. The industry standard for processing – large fruit with outstanding internal qualities – like Apollo it is also ideal for freshmarket production in the winter frost-free areas. Bush type with exceptional uniformity and yield potential. 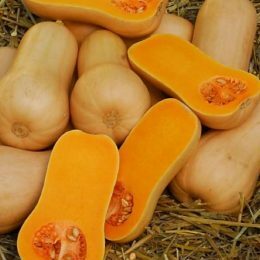 A unique butternut which is ideal for baby butternut production. A small to medium size butternut. The fruit are very uniform for an open pollinated variety and have good fruit quality.